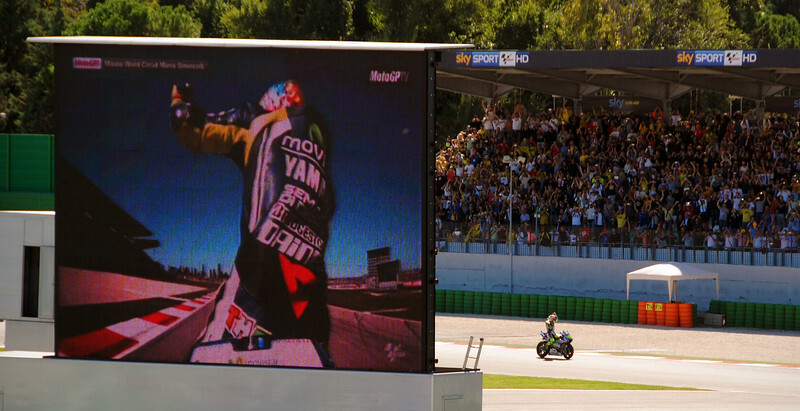 Sep 14 2014: San Marino MotoGP, Baby!!! 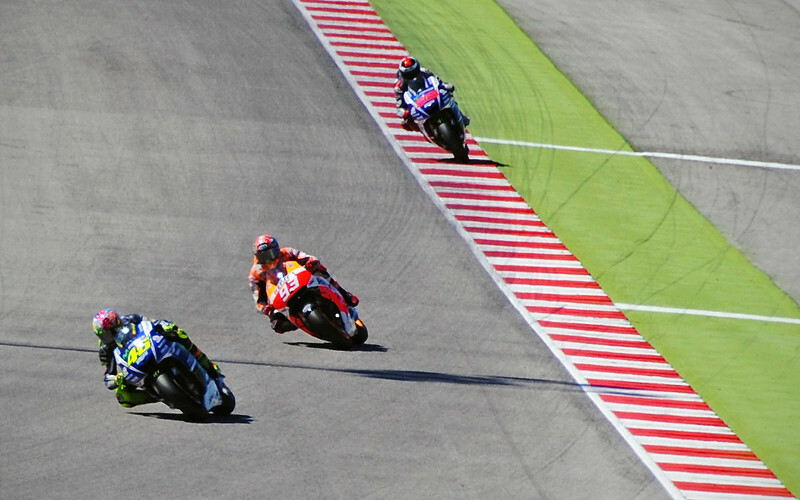 Spoiler warning: Results of the 2014 MotoGP Race at Misano discussed in this post! 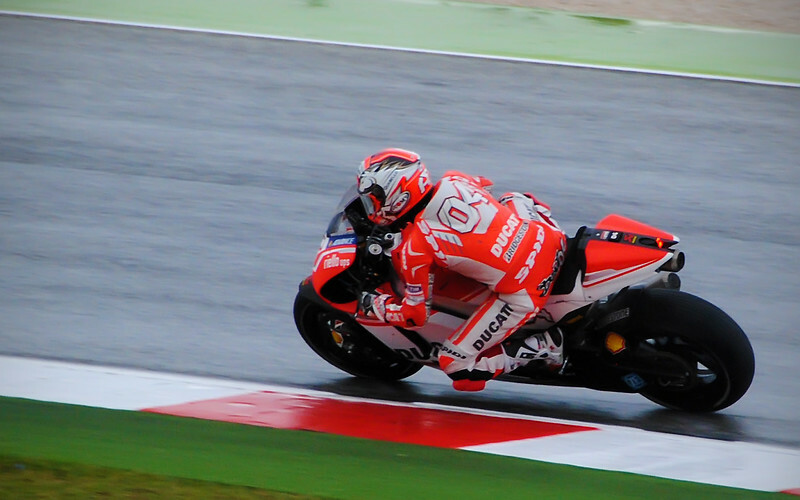 We're so excited to be attending the San Marino MotoGP! 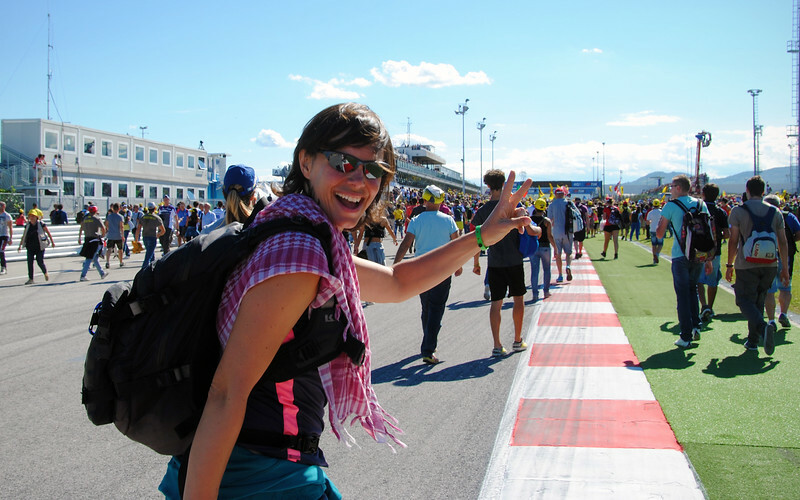 There are a couple of RV parks about 5 kms away from the Misano racetrack in the sea-side town of Riccione. We've set up our tent in one of them for a few nights to use as a home base to ride to the races and then explore the area. 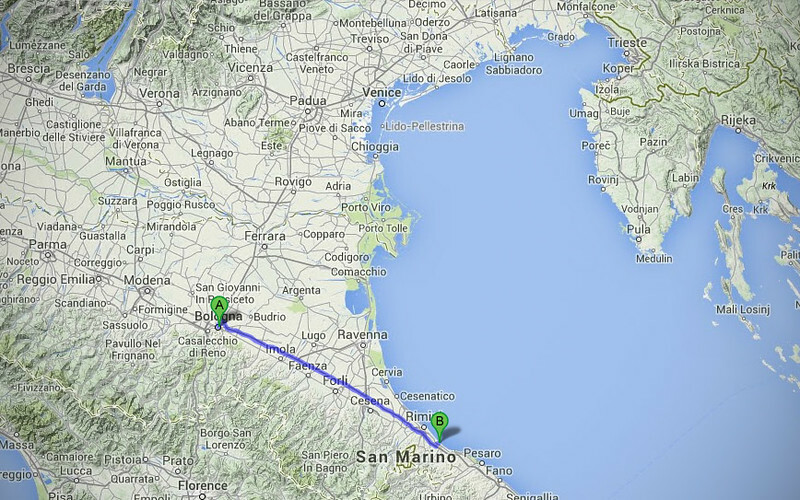 Just a couple of kms over is the neighbouring town of Cattolica, where Marco Simoncelli grew up. There's a lot of pedigree that's originated from this region, as if the pasta they eat here was imbued with extra-special Go-Fast-Lean-Hard vitamins and minerals. We rode through a light drizzle in the late Friday morning to try to catch the free practices. We really made an effort to get an early start to the day to be able to watch all the classes go out, but our camping skills were a bit rusty - we hadn't set up our tent in over a year, ever since leaving North America. 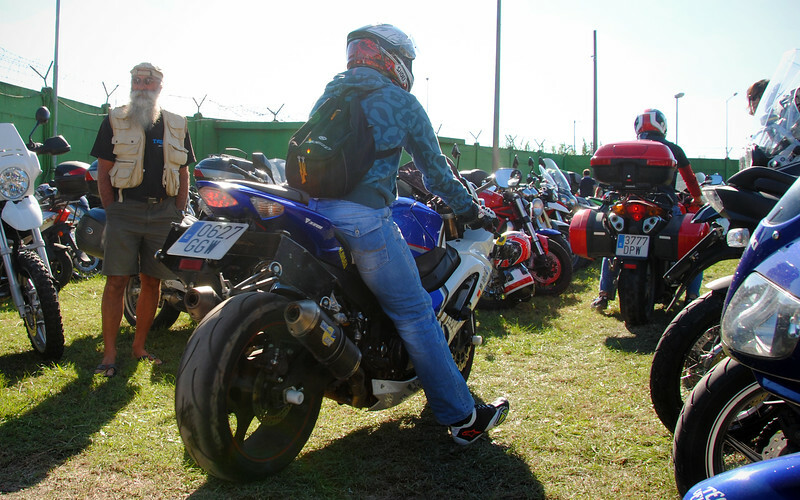 We were so disorganized and spent so much time fussing around the campsite in the morning that we ended up circling around looking for parking as the deep bass thunder of the Moto3 bikes erupted inside the stadium. These were expensive tickets and I was a bit angry at missing some of the action. After much confusion, we finally found the correct entrance after being denied entry through several VIP/all-access gates. 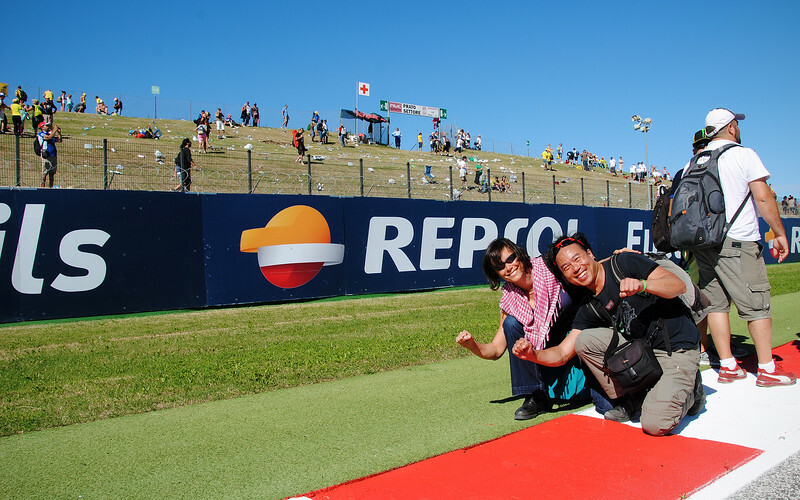 For the Friday, we had general admission tickets which gave us access to grandstand seating, positioned just after the Carro Hairpin. They were nice and close, but best of all, they gave us shelter from the pouring rain! We finally took our seats half-way through the MotoGP FP1. 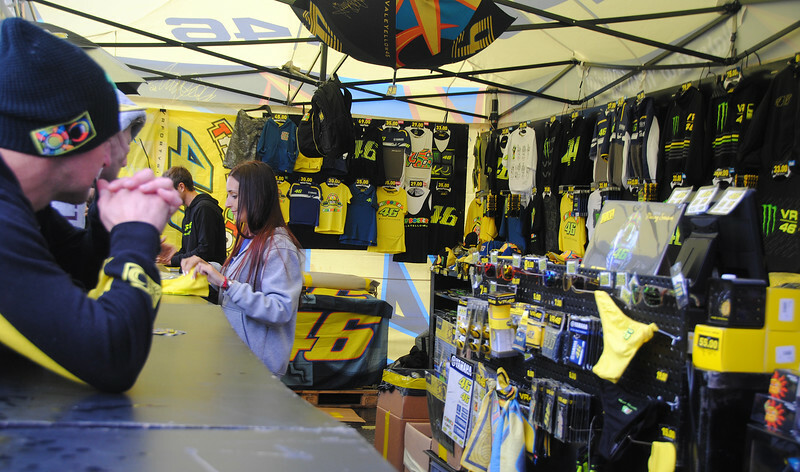 I can't believe the amount of money the VR46 merch brings in. There were always people lined up with Euros in their hands. Whereas the MM93 traffic was sparse, I think crickets had made their home inside the JL99 tent. 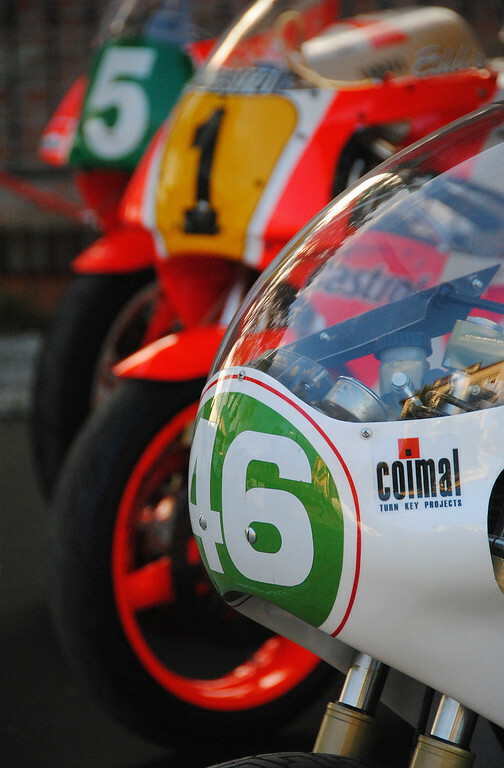 Our seats gave us a great vantage point of the bikes as they made their way through the hairpin. Unfortunately the proximity was negated by the rains, so I didn't get a lot of good pictures. 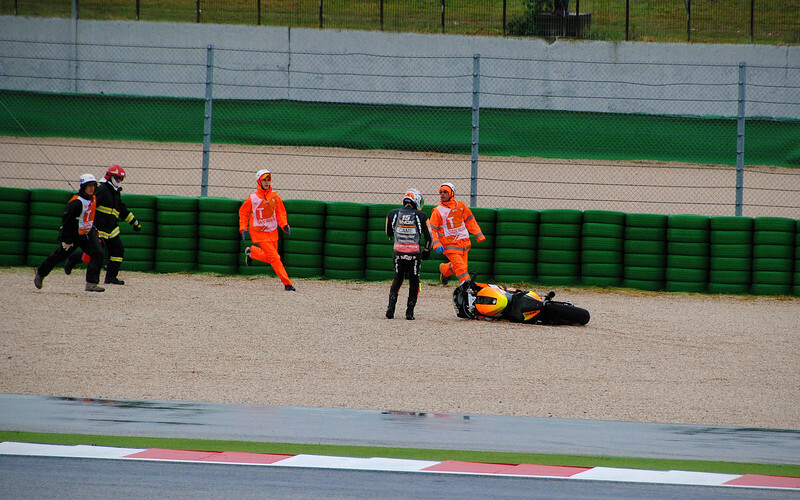 We found out that the beginning of FP1 that we missed was quite a crash-fest! The weather forecast was clear for Qualifying tomorrow and Race Day, so FP1 and FP2 were not that useful to the teams for setup or gathering data. It really seemed that the riders were out there just to give the fans a show, enthusiastically waving to the crowds on the last lap of practice. 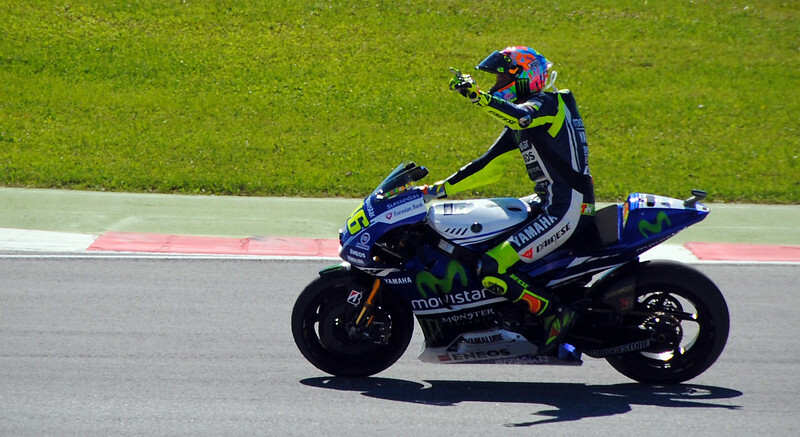 Every single lap that Rossi passed by, the stadium erupted in cheers and waving. 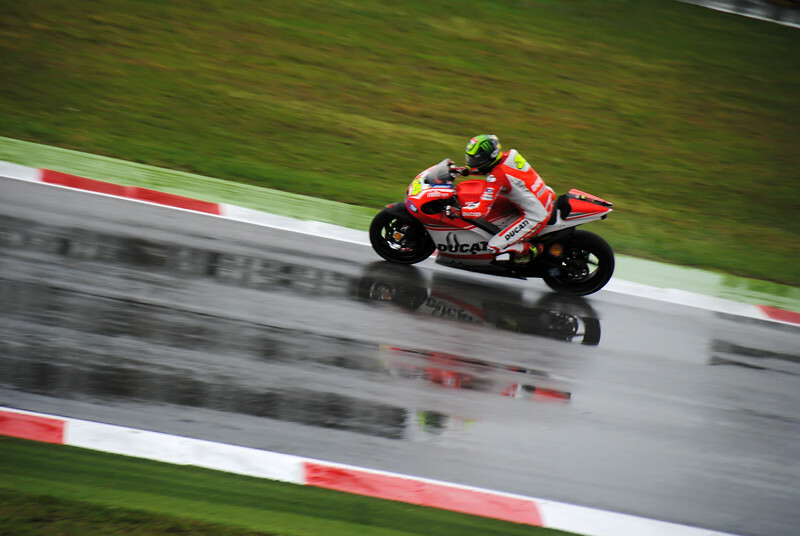 I am not the biggest Rossi fan, but it was not hard to be swept up in the Yellow Fever that burned hot even in such damp conditions. barely acknowledging the crowd after practice. Jerk. Just kidding, Jorge, please sign my hat? 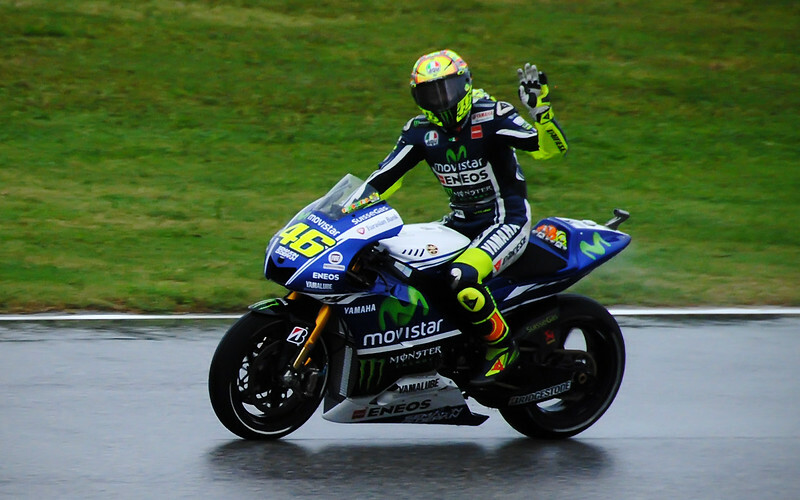 Very much unlike Valentino, who slows down to wave to the crowd after each session. 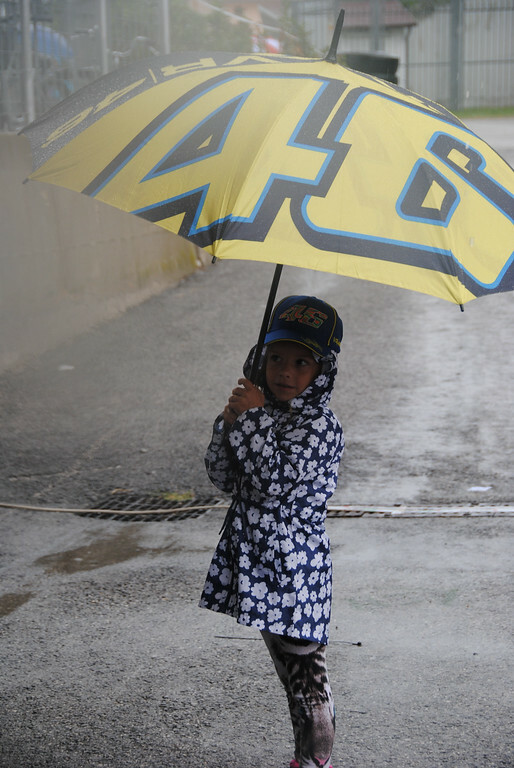 Universally loved, I'm sure he does this at every single track on the MotoGP circuit, not just Misano. They really corral the fans into their respective seating areas so you can't roam the entire stadium like at Indianapolis. So a tip to the budget photographers: take all your shots on Friday when they open up the grandstand to the plebes. A few people in the stands had 500mm lenses and they were getting great shots. I had a bit of lens envy. Thankfully, I have a SIM chip (from TIM - Telecom Italia Mobile) that we picked up in Bologna, so we could refresh the results on my iPhone to find out qualifying laptimes in real-time. However, everyone else was doing the same thing, and the TIM cell tower at the stadium lagged terribly, so "real-time" turned out to be "Italian-time", or in other words, "Late". Our perches in the rafters gave us a great perspective on relative speeds as the racers screamed down the back straight. 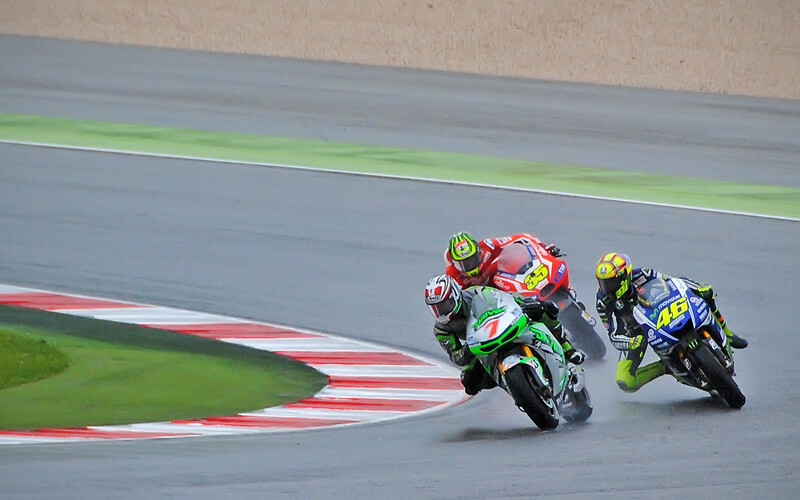 Throughout qualifying, I remarked to Neda that Vale seemed to have amazing pace. This was confirmed later on when TIM decided to work: Rossi was third on the grid for Sunday! Guess where we went after qualifying? 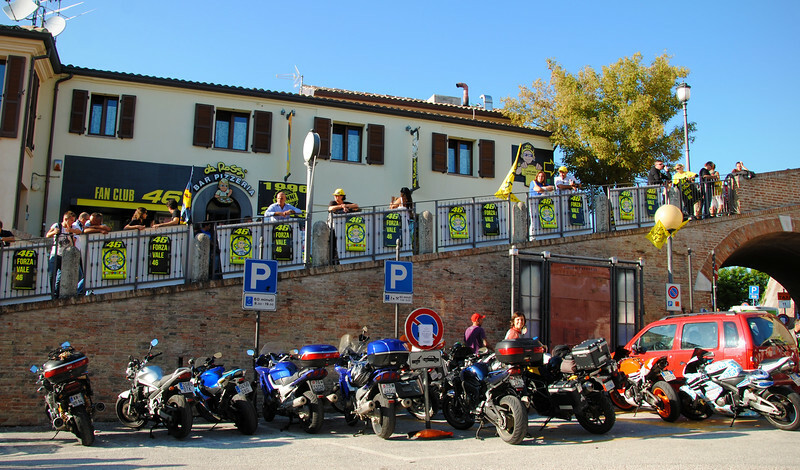 To celebrate Rossi's front row qualifying, we rode to Tavullia - his hometown! Literally 12.8 kms away from the racetrack according to Google Maps, we first filtered our way out of the stadium past the lineup of stopped cars (I LOVE BEING ON A BIKE! 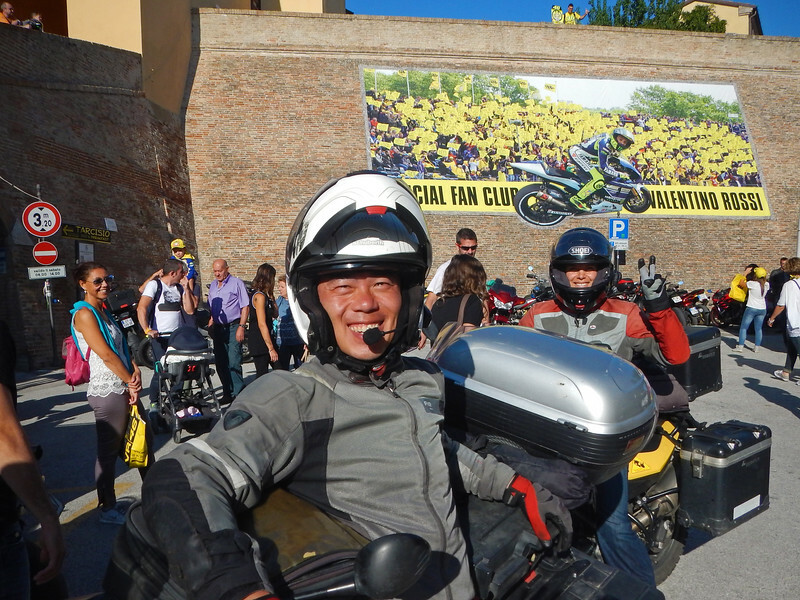 It was like there was no traffic at all) and then wound our way through the forested, twisty country roads of the Rimini region until we encountered an unusual speed zone sign as we entered Yellow Nation: the town's speed limit had been officially changed to 46 km/h! LOL! Thousands of yellow flags and #46 signs greeted us on every street as we rode into town. As expected, everyone else had exactly the same idea and the place was packed to the gills with motorcycles and fans! 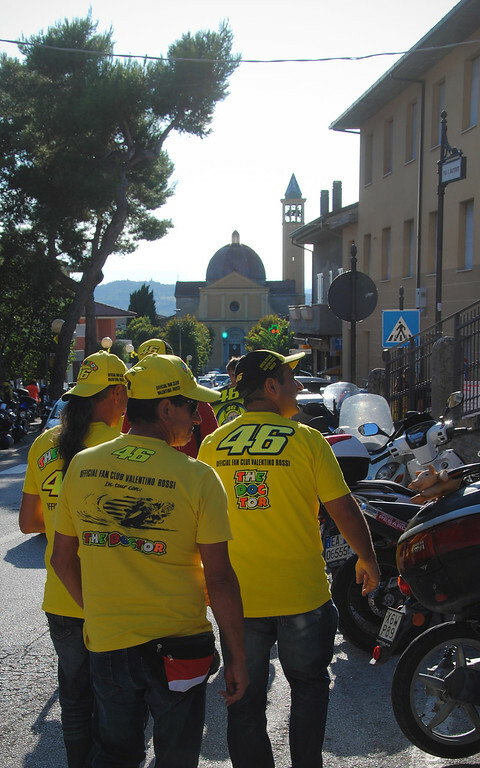 They kept streaming in every hour, and the tiny area in front of the Rossi Fan Club looked like a salvage yard with sportbikes and touring motorcycles strewn all over in every single nook and cranny. We managed to score parking right in front of Rossi's pizzeria! In order to save on costs, we are trying to stick to a strict no-restaurant rule while we're traveling through Italy. In this country, the restaurants tack on a charge on the bill called a "coperta" if you want to sit down to eat. This is in lieu of a tip, but the "coperta" differs from restaurant-to-restaurant and you have to ask beforehand to find out what it'll cost you to use their seat, knife and fork. We ate some pasta at a restaurant across the street from our campgrounds and the coperta was 30% of the bill. Nuh-uh. Not again, signore. The view from Pizzeria da Rossi's patio. 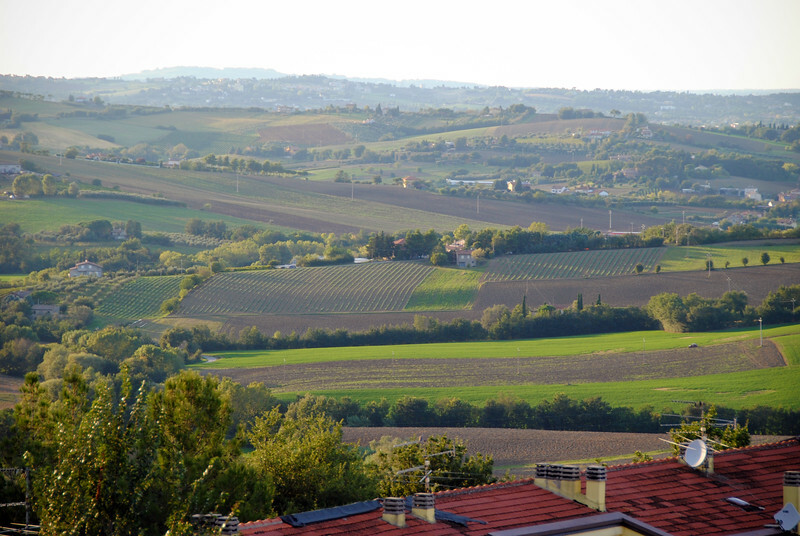 Tavullia is smack-dab in the middle of some really lovely countryside scenery! 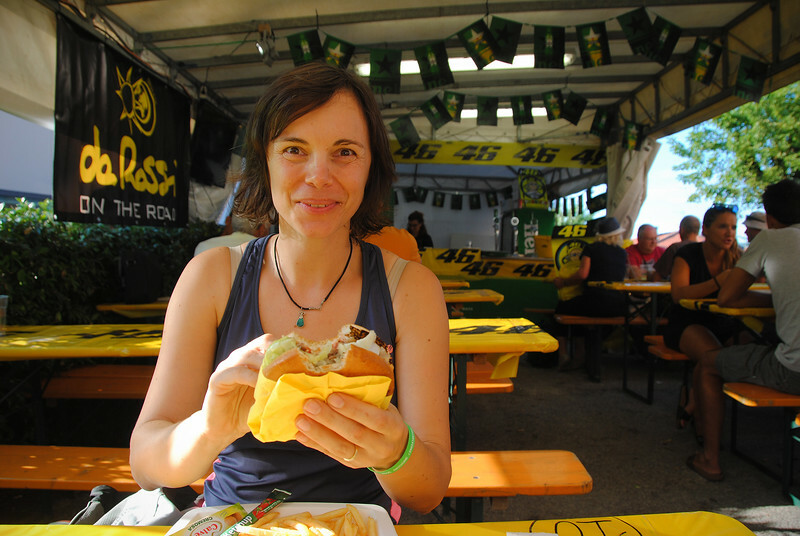 Where did Rossi's famous #46 come from? Answer below. Around the corner from the restaurant and fan club was a display with some special motorcycles. In one area, they had three motorcycles that Valentino's dad used to race back in the day. 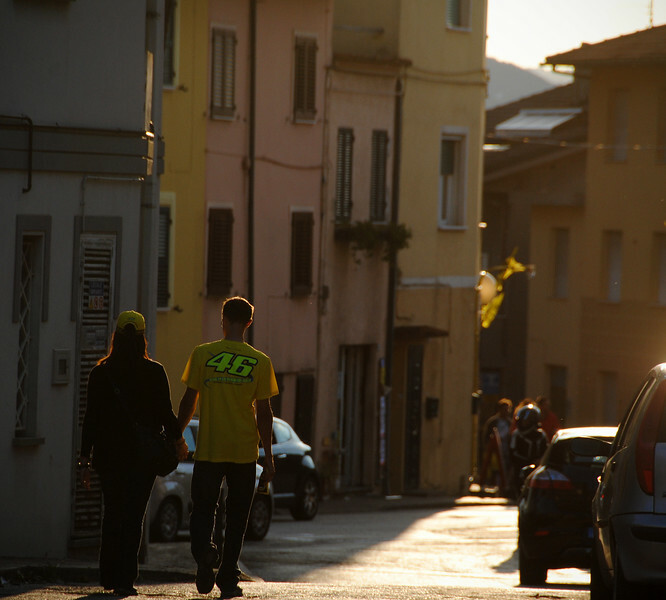 Rossi's father ran the #46 plate when he won his first GP race (in Yugoslavia, Neda! ), and that's where the junior Rossi got his famous numberplate from. It's a good thing we still have those altitude sickness pills that we never got to use in Peru. 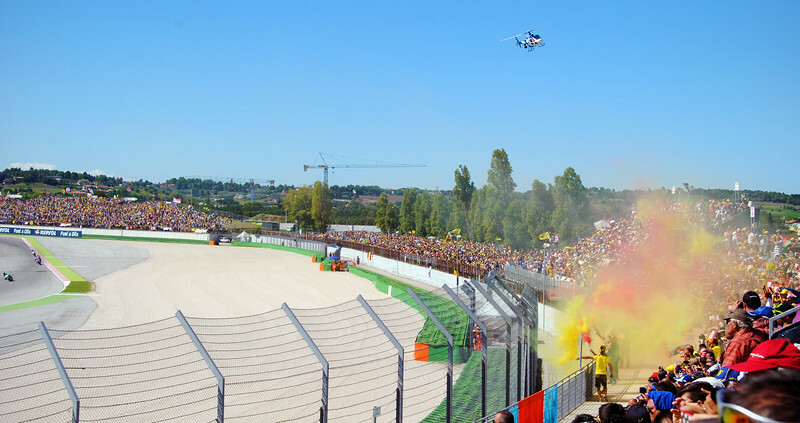 One tidbit about the Yellow Nation in Misano - I think there's an official Rossi fan seating area that you're morally (if not legally) obligated to wear a yellow shirt and hat so it looks good for the cameras as it pans across the stadium. 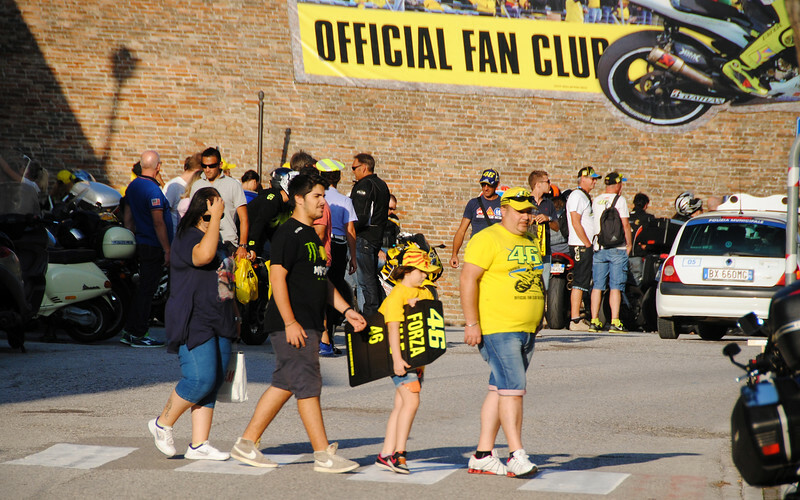 However, there are a lot more Rossi fans than meets the camera eye because for every yellow shirt walking around, there are equally as many black Rossi t-shirts and white Rossi t-shirts that make up quite a sizable contingent. 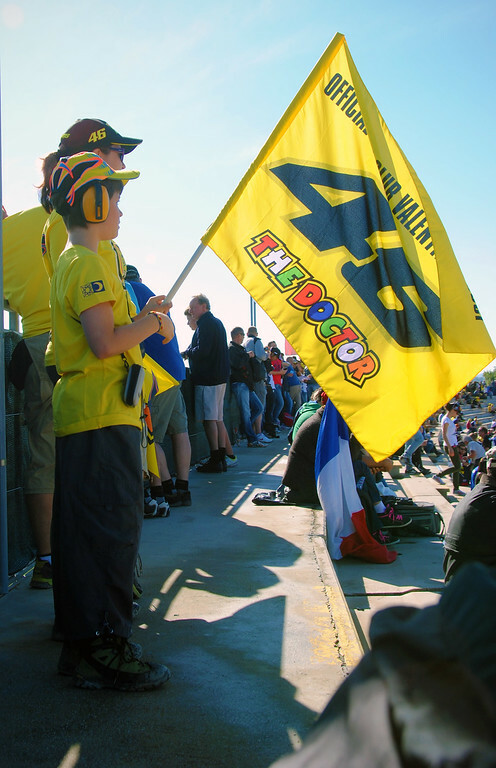 If I were to guess, I'd estimate more than a quarter, maybe a third of the crowd was wearing some kind of VR46 merch on their backs or heads. Ever wonder who lets off the yellow smoke bombs on the warm-up lap? It's these guys. 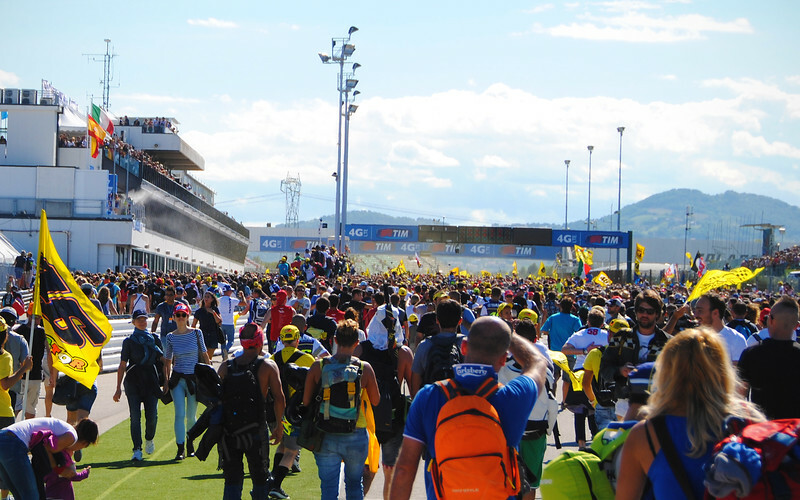 The Moto3 and Moto2 races were exciting, but we didn't realize just how quiet and sedate the crowd was until the MotoGP riders entered the track to line up at at the grid. The decibel level (which I know is logarithmic to begin with) went up exponentially! It's as if people were asleep before 2PM! As Rossi rode past us on his way to the start line, everyone stood up and screamed and yelled at the top of their lungs. It was as if 54,543 of his immediate family members, neighbours and closest personal friends all came to the stadium today. You could only see flashes of his signature yellow leathers through a forest of raised arms and pumped fists! It was totally awesome! What? I SAID, IT WAS TOTALLY AWESOME!!! it was like the Italian fans were trying to get all of Spain's attention to thumb their noses at the entire nation! How can it get any more exciting than this?!?! 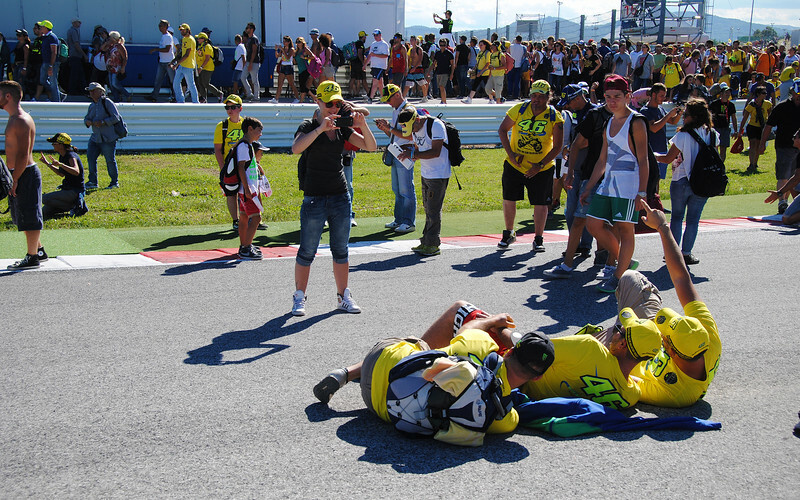 Misano is one of the few places where fans can run out onto the track after the race. So we did! 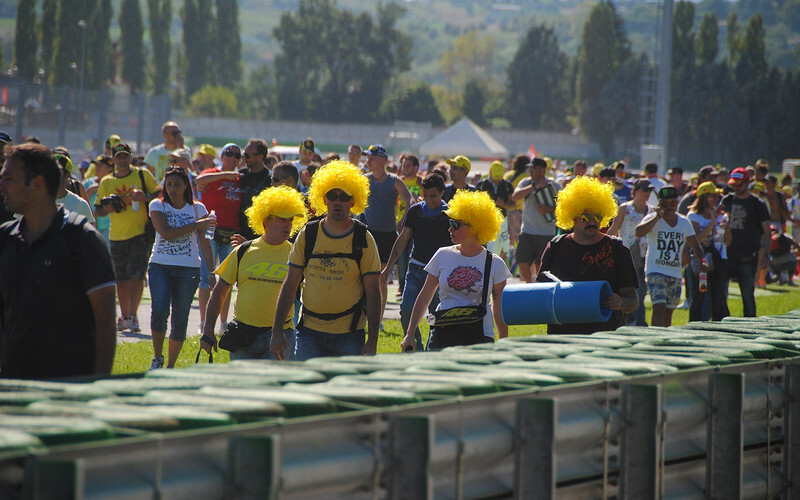 It's a long-standing tradition at Misano that after every MotoGP race, the fans stream out onto the track and storm the podium to celebrate with the victors. 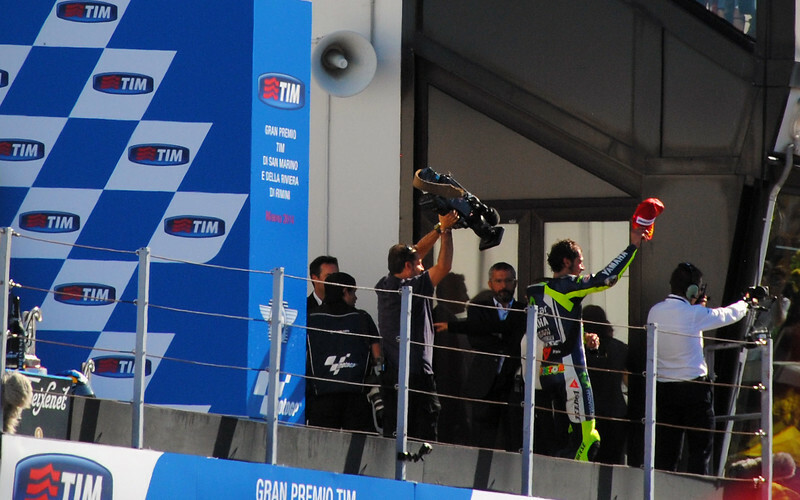 For a long time and for many years running, it had always been Valentino on the top step, which made it extra-special for the local fans. But after a long, protracted absence here he was again atop the highest box and 54,543 of his friends, family and neighbours were not about to pass up the opportunity of paying homage to their hero on his pedestal in person. "Hurry, hurry! I can hear them playing the Italian national anthem!" Our seats were soooooo far away that even with us rushing to get to the podium (some of the more enthusiastic fans started sprinting through the gates on the final lap), we were met with a solid wall of people between us and the podium. Ugh, I suffered pangs of zoom lens envy again as we squinted into the sun to see our victor greet his friends, Rimminians and countrymen. Marquez Who? Vale, Jorge and Dani on the top steps, just like back in 2009. Victorious Vale in front of his hometown fans. It just doesn't get any sweeter than this. 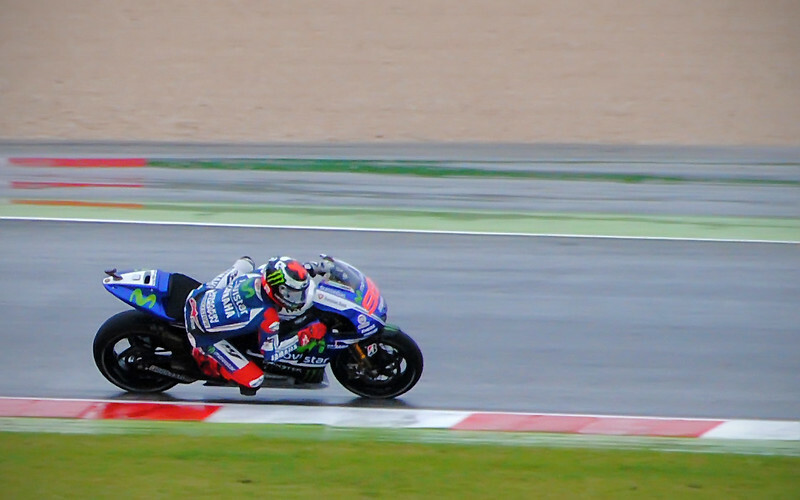 Knee-down at the Misano track! What an awesome, awesome experience! 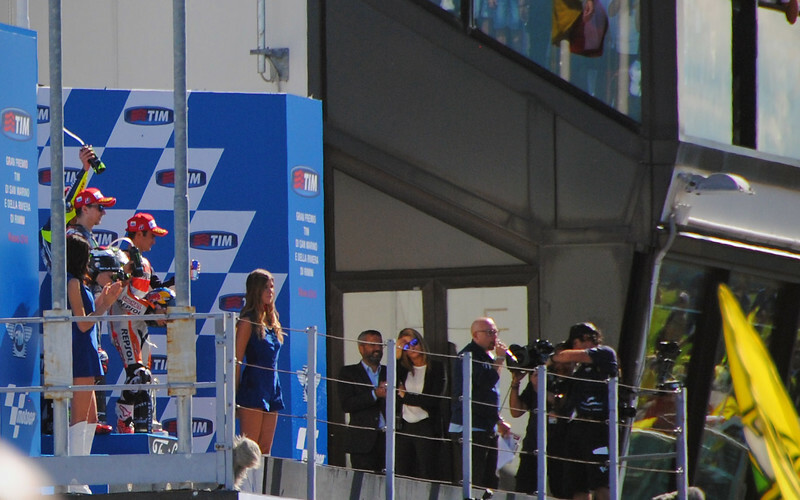 It was so much more than we had hoped for: watching Valentino Rossi win at his home track after such a long time away from the podium, and to do so against such a formidable foe like Marquez in his prime. It was like an Italian fairytale come true!